Robin was born in Hamilton in 1960, was raised in the central mountain area of the city. He graduated from Hill Park Secondary School and obtained his Bachelor of Science degree from the University of Toronto. He has been working in the field of Industrial Automaton for the past 24 years, and is currently a technical sales representative for Tubex Technology Machinery. Robin and his wife Sherry have been married for 34 years and have three adult children: Jaclyn, Jennifer and Mitchell. They recently became grandparents with the birth of baby Evelyn last October to Jaclyn and her husband Ryan. Robin's Masonic Career began in 1981. He was installed as W.M. of Hamilton Lodge No. 562 in 1988-89. He served as District Secretary in 1995 and was appointed Grand Stewart in 1996. He joined Buchanan Lodge 550 in 2001 when the Hamilton Lodge went dark, and has served as Treasurer there for the last 10 years. 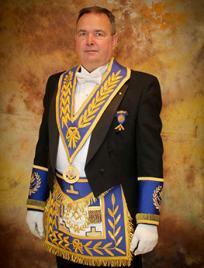 Robin is a Royal Arch Mason and also a 32 degree Scottish Rite Mason in the Hamilton Valley. Besides spending time with family and friends, Robin's other interests include playing drums and guitar, following professional football, hockey and F1 Racing, and playing an occasional round of golf .